Since the crab is already cooked, oven time is purposely brief to heat without toughening. To heat: Thaw crab legs, if frozen; rinse. Arrange in shallow baking pan. Add hot water to fill pan ⅛-inch deep. Cover with foil. Bake in a preheated 450 F oven until heated through (7-10 minutes). To serve: Arrange crab on serving platter; garnish with lemon wedges. Serve hot with clarified butter (below) or add a twist of garlic with Lunds & Byerlys Scampi Finishing Butter. Use a nut or seafood cracker to split the shells. Clarified butter: Melt butter completely over low heat. Remove from heat; let stand a few minutes, allowing milk solids to settle to the bottom. Skim foam from top. Pour off clear liquid (clarified butter); discard milk solids. 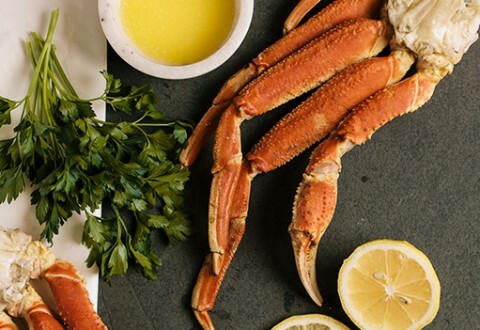 FoodE tip: When purchasing crab legs, allow about ¾-1 pound king crab legs or 1 pound snow crab legs per serving.